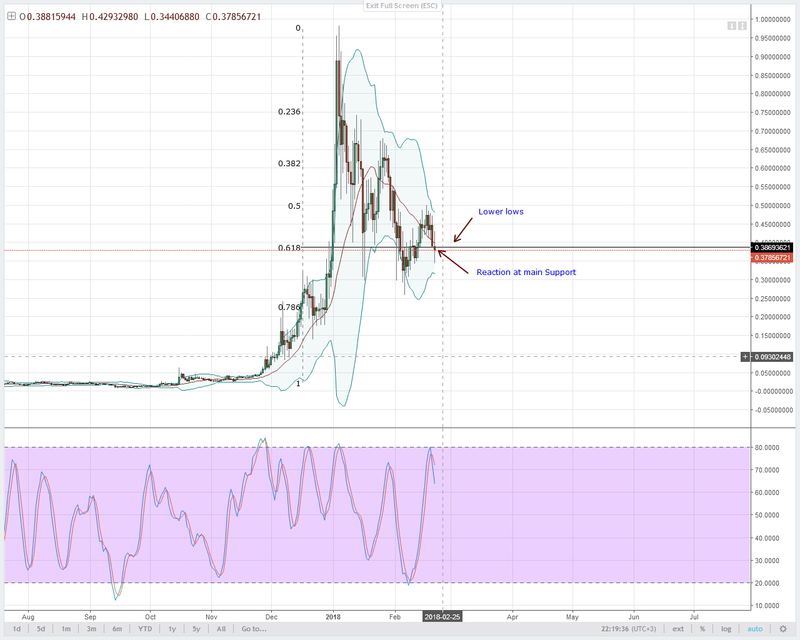 There is a broad base correction back as we are seeing in pairs as NEO, EOS, LTC and even Lumens. 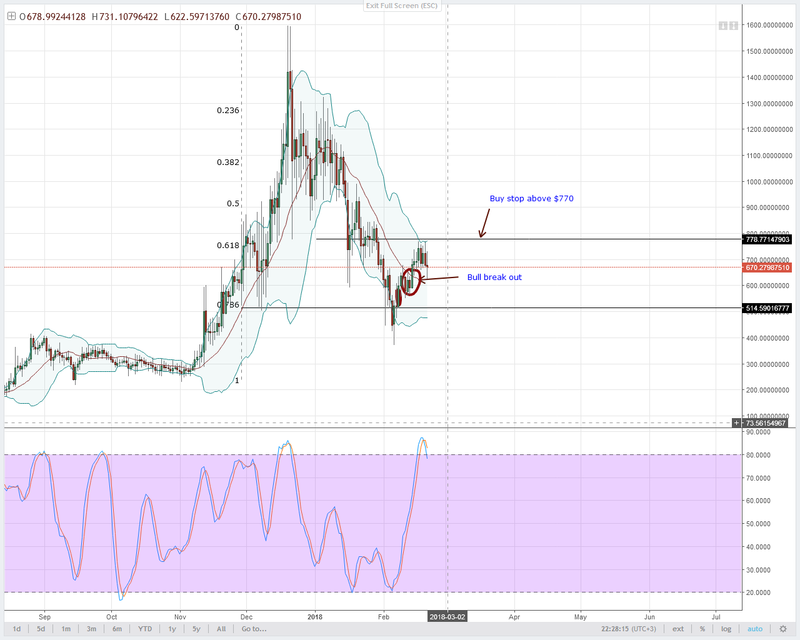 DASH remains resilient but there is room for downside especially if we see any depreciation below $620. Selling looks like a very short term bet as we anticipate correction back towards break out levels. By doing so, prices would be completing the retest phase which is so common after any form of break outs. There are two important price developments that should influence price movements in the next sessions. One has to do with that breach and close below the middle BB and $0.40 in the daily chart. The other is that bear candlestick banding along the lower BB in the 4HR chart. 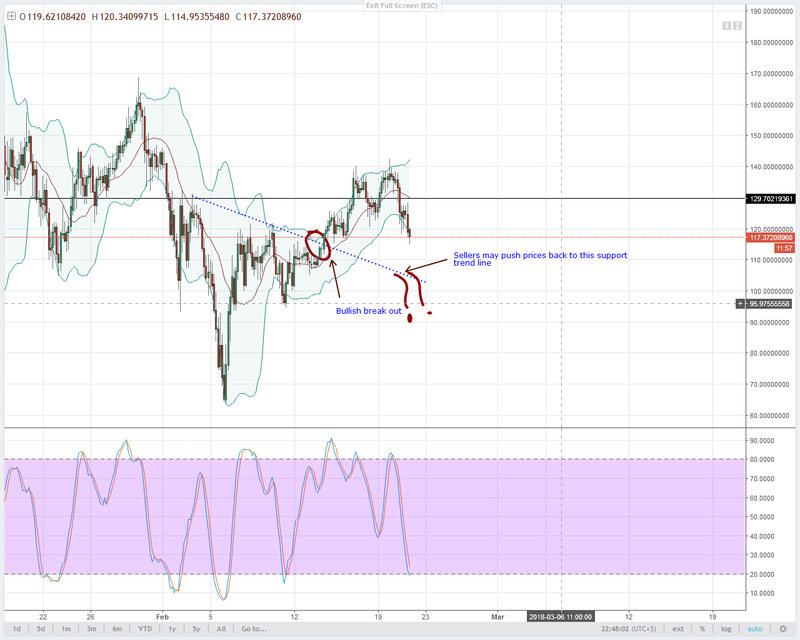 If we extrapolate our view and consider our previous analysis, then we realize that prices might actually fall back and retest $0.30 before we see some trend reversal bars printing in the 4HR or there about. After all, as we have say time and time again, the trend in higher time frames take precedence. 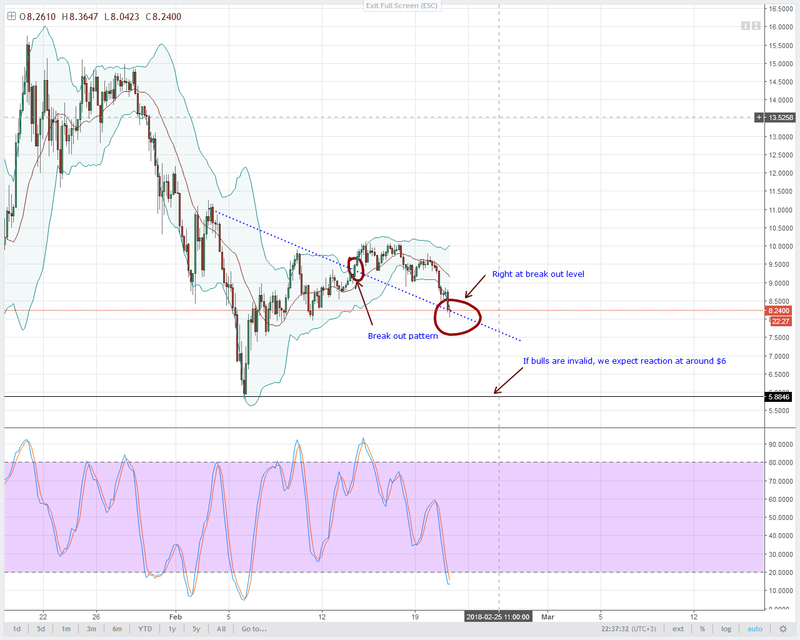 Confirmation of last week’s bull pressure is important and that is why any form of Lumens higher highs between $0.30 and $0.34 shall be a basis of long entries for aggressive buyers. Relative to other tokens, DASH is actually resilient. When we check price action, we notice that prices are actually resisting bear pressure and so far, despite clear sell pressure in other high cap tokens, prices are still hovering above $620, the middle BB. In line with this, it means buyers are still in charge even if we have this clear stochastic sell signal following period of horizontal consolidation. We are obviously in a bullish break out and we shall stick to buying on dips but for late entrants, proper entry should be at around $770. That’s slightly above February 16-20 consolidation or the 61.8% Fibonacci retracement level. The drop has been rapid and as it is, prices are back to the break out level. 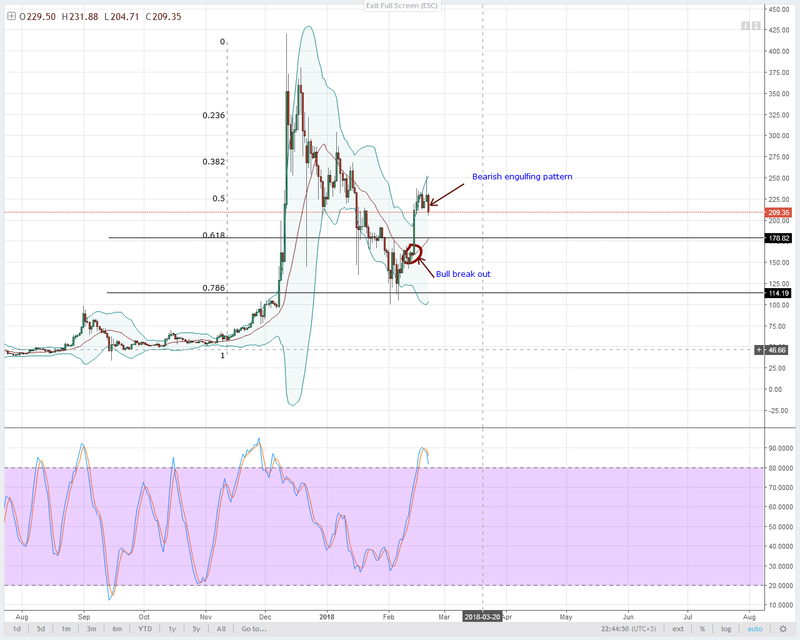 Of course, if we consider our previous analysis, then we are bullish if and only if there is a bounce at around $8 and $8.0. If not, and say sellers drive prices lower then we shall cancel this bullish forecast and stay out of this trade as we wait and see what happens at February 6 lows of around $6. This is turning out to be a classic bullish break out pattern and we are right on the second phase-the retest. In this case, even though our stops below $230 were hit as per yesterday’s analysis, the bearish engulfing candlestick means sellers might push prices right back to $160-$180 on the down side. That is right at the middle BB in the daily chart where LTC buyers broke above the liquidating effect of the 20 period MA. 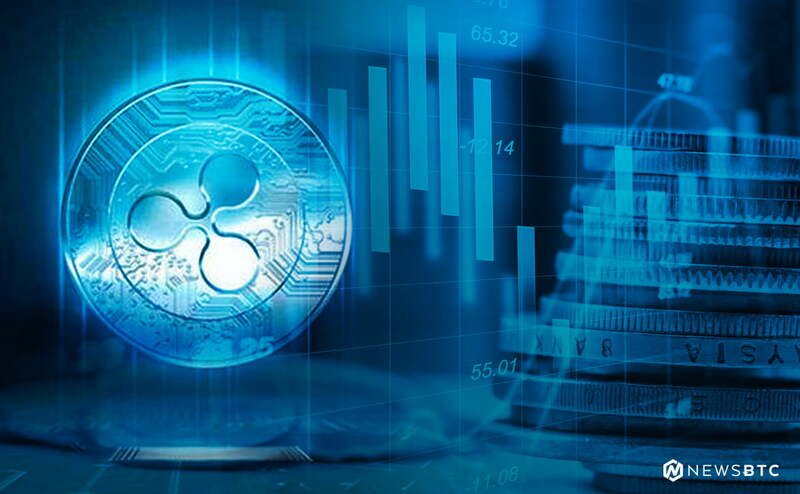 Now, as it is, sellers might drive prices lower in the course of the day and that is why bears ought to ride with the tide back to $160 or there about. Referring to yesterday’s price analysis, NEO sellers did slice through $130 like it didn’t exist. At the moment, the most likely destination looks to be $110 as per our earlier forecast.